The School of Engineering has over 800 undergraduate students across 15 degree programs. But until recently, the umbrella organization that sought to build a closer engineering student community had been inactive. Stocking, current chair of the ESC, shared that the council was formed to resolve the lack of coordination and community among engineering students and organizations. “The creation of the council was inspired by the common problems faced by engineers and engineering clubs, such as a lack of funding, a lack of space and most importantly, a lack of organization and communication,” Stocking, an electrical engineering major, said. According to Ezenwa, the current form of the ESC is not the first attempt at creating a council of this sort at Tufts. “The organization was originally created in 2010, but it quickly died out around 2013, likely due to a lack of a structure or framework,” Ezenwa, a chemical engineering major, said. Since its rebirth in 2015, the ESC‘s work has been focused on advocacy for club collaboration, engineering education, professional development, dialogue with engineering faculty and administrators and increasing academic opportunities for engineers. Stocking sees the ESC as playing a role in bringing together engineers across the disciplines who take classes and do research in all corners of the campus. “The physical infrastructure of Tufts makes it so that individual engineers are found in disparate locations across campus. Some engineers are seen at Halligan, while others are at Anderson or at 574 Boston. These engineers don’t necessarily meet that often, so a dedicated organization like ESC helps bring them together to collaborate,” Stocking said. Ezenwa shared that through the ESC, clubs can pool together to host events together or collaborate on planning an engineering-related program. The ESC recently held its annual kick-off barbecue at the patio of the newly opened Science and Engineering Complex (SEC). Garbarini explained that events like the annual barbecue help to further interaction between engineers specializing in different disciplines. “The events that occur with the ESC help bring mechanical, civil, electrical and biomedical engineers alike together under an umbrella,” Garbarini, an electrical engineering major, said. Garbarini said that students can also look forward to the annual Engineering Week, or E-Week, held in the spring, where teams from each engineering discipline compete in a week-long series of quizzes and activities that help them bond and interact with their fellow engineering students. “Though each discipline has its own friendly rivalry, this week is the kind of thing that keeps the ESC and the larger community together, and it reflects the legacy we want to continue,” Garbarini said. The organization of the ESC also shows the emphasis on internal collaboration. Stocking estimates that nearly 20 of the 23 clubs related to engineering at Tufts are represented on the ESC. In some cases, these representatives are not necessarily heads of the organizations that they represent, Stocking said, showing the ESC’s effort to increase collaboration throughout the community. Ezenwa agreed that there are no necessary divides in positions, recognition or hierarchy within the ESC and added that the council aims to work with all engineers equally. Stocking mentioned that the ESC has had a great deal of success in bringing engineers together and dealing with various issues. For instance, Stocking explained that the ESC managed to secure additional funding for the Tufts chapter of the National Society of Black Engineers and the Tufts Society of Latinx Engineers and Scientists on top of the funding they receive from Tufts Community Union (TCU) Senate. Stocking added that there has also been greater dialogue with the faculty and administrators of the School of Engineering to increase support for the academic and professional development of engineering students. Stocking and Garbarini both said that this sort of interaction with faculty, who are typically at the school for much longer than students, helps sustain the support that the ESC and its affiliated clubs receive, furthering the legacy of a connected set of engineers at Tufts. According to Ezenwa, the ESC does not look to the TCU for funding or recognition, but instead works closely with and is funded by the School of Engineering. Garbarini noted that the ESC differs from other student organizations that are recognized by the TCU Judiciary. “The TCU does a remarkable job of catering to student life. We however, take care of academic life specific to the engineers,” Garbarini said. Stocking added that the ESC meets the specific concerns of engineering students. Though the individual organizations represented on the ESC are recognized by the Judiciary, Ezenwa said they look to the ESC for funding, support and connections. 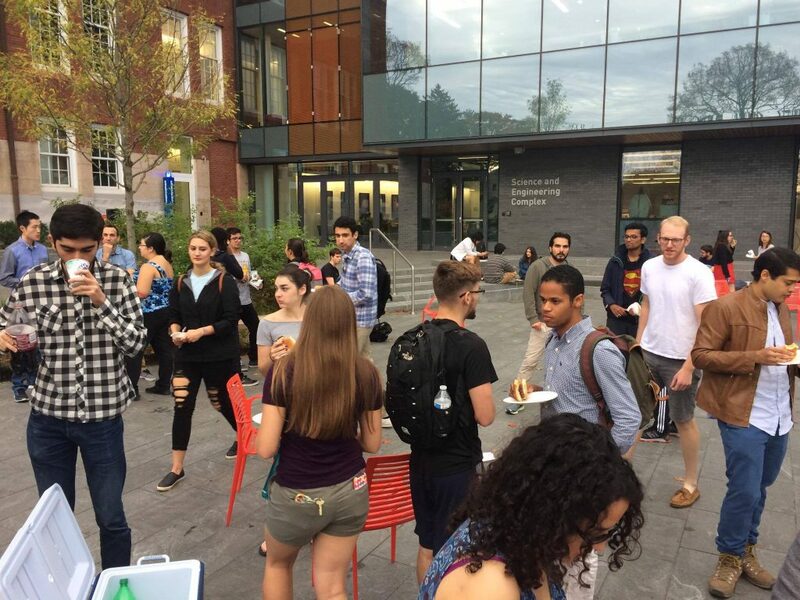 As an umbrella organization for engineering students, the ESC can also reach out to students and faculty in the School of Arts and Sciences to fortify the dynamic and diverse Tufts community. Garbarini expressed hope that the ESC will continue to create a cohesive community of engineers at Tufts.